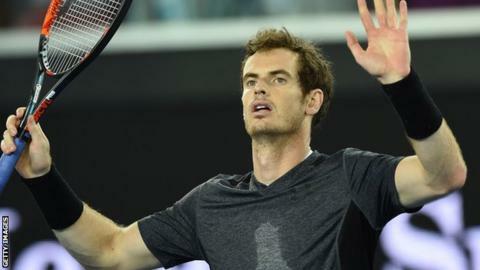 Andy Murray recovered from a second-set slump to see off a spirited challenge from Portugal's Joao Sousa and move into the Australian Open fourth round. The world number two easily took the first set but allowed Sousa back in before recomposing himself in a 6-2 3-6 6-2 6-2 win against the number 32 seed. The 28-year-old Briton will next play Australia's Bernard Tomic, seeded 16th. As Murray was on court, news broke of his father-in-law Nigel Sears collapsing in the Rod Laver Arena. Sears coaches Ana Ivanovic and was watching her match against Madison Keys. Murray's brother Jamie told reporters that the 58-year-old, who has been taken to hospital for tests, was "conscious, talking and sitting up". Sears' daughter Kim is not in Melbourne in support of her husband Murray as she awaits the birth of their first child in a few weeks. Murray, unaware of what was happening, went from dominating the opening set to being broken in the first game of the second, with Sousa going on to level. But the Scot raised his game to secure what was in the end a comfortable victory, breaking Sousa's serve twice again in the fourth and final set. Immediately after the match Murray left with his mother Judy to visit his father-in-law in hospital, with his post-match news conference cancelled. "It was tricky. I didn't feel I was in a great rhythm and wasn't hitting the ball cleanly at the start. He was hitting the ball great, close to the lines, and making me do a lot of running," he said in a statement released through tournament organisers. "Once I started to hit the ball a little bit cleaner towards the end of the match I was able to get him in his backhand corner and dictate more of the points. "I just tried to keep fighting. At the end I was actually hitting the ball well and felt better at the end. It was good to get through that one."